Good morning friends. I’m so tickled to be back for Day of Giving Friday with a new card! I’m a little late with my post today, but I have delightful company at my house and I hope you’ll forgive that each morning we are sitting on the porch in our pajamas lingering over our coffee – loving every minute of fall. I brought my Mother back with me and there’s lots of catching up going on – a true blessing at a good time for both of us. In going through my bin of cards I discovered a card I had not shown before and the sentiment is so positive and so, so appropriate. 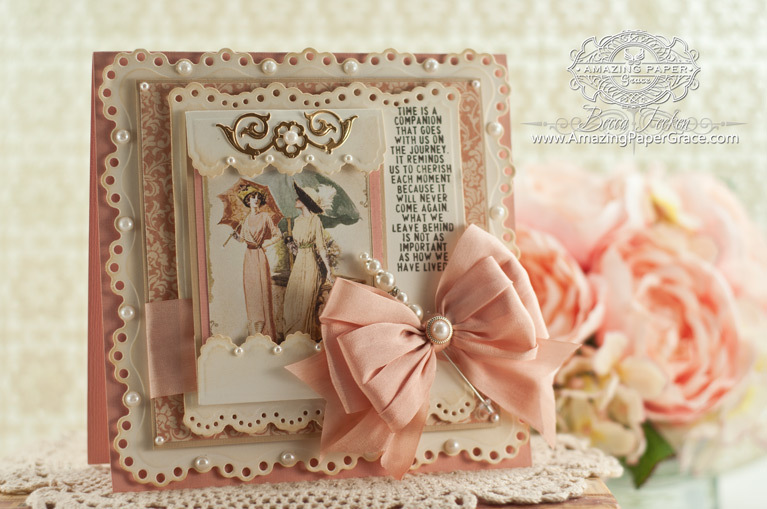 I hope you won’t mind, but there are not many specifics to give on the supplies used other than the paper is Graphic45 and the sweet flourish over top of the ladies is Spellbinders Corners & Accents One (an embellishing die that never fails me :-)). 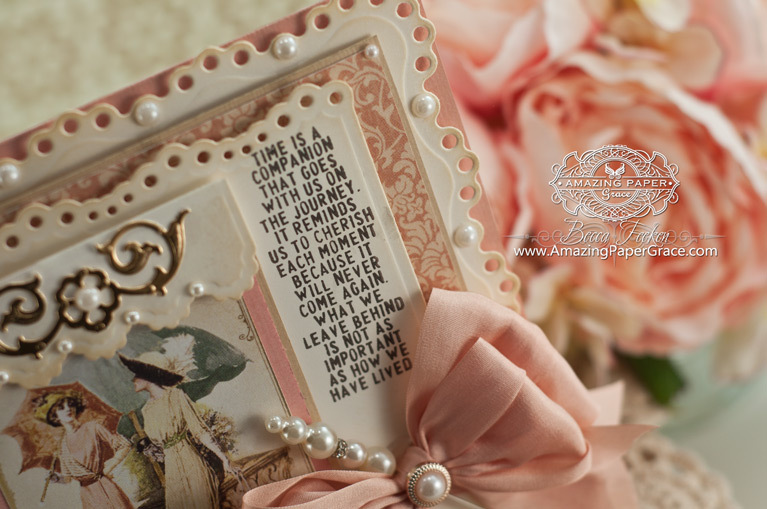 That stunning sentiment is one from a Tim Holtz collection. Since today is Day of Giving Friday, you can win this card by leaving a comment. If you are new to my blog – you can find out more about Day of Giving on my FAQ List at #11. For your comment today, what’s a lovely memory or cherished routine you associate with fall? For me, the sky seems bluer and the air seems so crisp and full of hope. I love those first fleeting signs that the seasons have changed – a walk in the morning chill is a cherished routine and makes me appreciate the beauty in changing seasons. How about you? Happy Friday sweeties! I hope you have a fabulous fall weekend planned! Sorry to have missed your last few posts, they are all stunning, so beautiful as always. Love this one too and my memory of fall was as a child walking through the leaves on my way to school, I have always loved Autumn, its my favourite season of the year, love all the changing colours, so beautiful. For me it is the memories of going to the woods with my father and cutting wood for our fireplace for the winter. Seeing the beautiful changing of the leaves and smelling the wonderful smell of fall and pine leaves. My father is gone however; just the smells alone bring him back. Hi Becca, I have not been on your blog for a long time as we have sold our villa here in Spain and have rented an apartment nearby .the disadvantage is that we no longer have Internet and so have been out of touch. I got a shock this morning when I read about your brother Ben having passed on,my sincere condolences Becca and also for the rest of the family. My heart goes out to your mother as it must be devastating to loose one of your children. Please Becca give her a big hug from me and I shall have you all in my prayers tonight. Bless you all. Now about your last few cards ,they are gorgeous and the sentiment on today’s card is very appropriate! How nice that your mother is staying with you and you are enjoying this important time together. At the moment we are staying in a hotel in Benidorm as I had to see the cardiologist for a half yearly checkup,all is well and I can catchup with my mails and blogs. Leaving Sunday ,I will have to find an Internet cafe near where we now live to keep in touch with everyone. God bless you!!! You sweet angel!!! Have a wonderful time with your mother and enjoy precious time together. My favourite autumn memories are of the times we took our children back to Jesus College, Cambridge where the grounds have many, many huge Horse Chestnut trees and where we were blessed to be able to park under the beautiful falling leaves. As the students were not too interested in collecting them, the children had the pick of the huge glossy brown conkers, bursting from their prickly cases. The look on their faces as they found scores of ‘treasures’ was priceless. As Keats said the season of mists and mellow fruitfulness. I do love autumn. The light changes and seems to illuminate those late flowers. And the Fruit. Orchards, lovely tasty apples, pear’s and Black berry hunting. And then apple and BlackBerry pie. Mmmmm…. WAUW what a beautiful card here again today Becca. I just love these beautiful colors you´ve used for it, and I have also been missing your gorgeous bows, so I´m so glad to see one here today. So glad to hear your Mom is spending some time with you. How lucky you are to both have each other. I too would love to sit on your porch in pjs and drink coffee with you. Someday I am going to surprise you and stop in to meet you!!! Another beautiful creation which I would love to call my own. Have a blessed Thanksgiving!! The colors are so soft and restful. Hi Becca & hello Becca’s mom! The card is so lovely. I love all your layers, the visual texture it gives is wonderful. I’ve got to really try to do more of that on my cards. The fall leaves and all their color is a good memory for me ( grew up mostly in Massachusetts) but even better… I love the crunch beneath my feet, still do! Oh and I can’t forget the clothes! Sweaters, boots, hats…. oh my!!! what a wonderful time of year. Hi Bacca. Such a beautiful card and I love the sentiment. Becca, Hugs to your mother from me. Sympathy to all of you for the rising into Heaven of Bruce. FOr me, it’s the first colors in the leaves that make me feel it is truly fall! Love traveling to Gatlinburg and seeing all the trees. I love the changing of the seasons, but going from summer to fall isn’t of my favorites! Love your card today. It’s so quaint and elegant! Hi Becca, how true the words are on this beautiful card. So exquisite and detailed. Very pretty! Morning Becca and how wonderful that you were able to bring your Mother home with you, Enjoy the morning coffee on the verandah with your pyjamas and your Mum, you never know how long you have her for. My best memory of fall is when we travelled to America and saw all the lovely fall colours, We do not have a lot of Fall here in Queensland. too tropical for that. Beautiful card Becca, and I love the image you have framed :-). We do not have Thanksgiving or halloween to associate with Autumn, but I must say I do appreciate the cooler temperatures, rain if we have had a drought, and the colour of the leaves. What a beautiful card. I love everything about it. I love to see the season change. Fall is the most colorful and beautiful season. I also love to take fall pictures with our kids. The piles and piles of leaves to jump in is my favorite memory of fall. Now in NH we sit on the porch and watch the leaves turn color. The leaf peepers (people who drive very slowly along our highways watching the leaves turn)are now a tradition as well. Enjoy your mother’s visit and enjoy memory lane. Again, such talent. For me, it’s always that first homemade apple pie. Yum, yum! this is such a beautiful card, Becca. and the sentiment is divine. How wonderful that you brought you mother home with you. This is such a difficult time for both of you, but it can be a joyful time as you share wonderful memories of your dear brother. Enjoy your time together. Your card is beautiful. I love the sentiment, and it is so appropriate. What a lovely card! And the sentiment is so appropriate. You’ve showcased it beautifully here. So happy that you are having P.J. Time together just what the doctor ordered ! I love the card and the words are so right for this week I have missed your bows they are so special . How lucky are we to have our mothers with us. I love my mother to the ends of the earth, I wish I could be with her to share each morning cup of coffee, but she is very happy at her home and I cherish the time we do get to spend together. Wow! Such a stunning card Becca! Love the image and sentiment!! I love the fall. Great sleeping weather!!! But, the thing I look forward to are the Holidays. This is one of my favorite things, when the whole family gets together. We host Thanksgiving and Christmas every year, and I love it. I love to cook and love having the entire family together under one roof!! This year, we will only be having 15-17 family members at Thanksgiving. Usually we have more. Not sure how many will be joining this year at Christmas. Flying is getting a little scarry these days. I love your card Becca. This is one of my favorite G45 collections. So beautiful. I’m so sorry I didn’t realize Ben had passed. I am praying for you and your family. I’m truly sorry for your loss. I know God is your strength and comfort. Your card is just stunning. I love everything about it. Today, I received my newest dies in the mail! My much longed for “Cinch and Go Flowers” and “Flourished Frames”. I’m anxious to begin playing with them. My memory is putting up a tent in our back yard with my kids. The three of them and myself would sleep outside and eat all the things would should not. We had so much fun and I should do miss the good times we had. Hi Mom! (waving and in awe you are some place warm enough to sit on the porch in jammies sipping coffee!!) So glad you are together and spending time with cherished memories and hanging out. What a blessing for you both. Enjoy your special time with your Mama. Thank you for sharing your beautiful creation again! It never ceases to amaze me, you seem to “outdo” yourself more and more. Fall is my favorite season! I love the beautiful colors that are the last bloom of summer, the harvest of fall squashes and sweet potatoes, the wonderful crisp mornings walking through the garden and seeing dew on the cob webs, the wonderful bright pumpkins up beside the corn stalks, all herald that fall is here! Time to GIVE THANKS! For me it is snuggling under a handmade afghan (Made by me) with a warm cup of homemade Hot Chocolate with lots of mini marshmallows while gazing at the changing leaves through my window. This card is so beautiful and the sentiment so true. I love the bow and the pearl pin. Do you make your own pins? Or do you buy them premade? I would love to make my own someday. So sorry for your loss. It must be terribly hard what you and your family went through. My prayers are with you all. A fun thing we do in the fall is to gather acorns with our grandchildren. Recently it was 2 seven year old, a four year old and a 20month old. It is such fun watching them. Of course they have to look under all the bushes for “treasures”. The latest was a small gin bottle that they put berries in and topped with an acorn cap. They were so proud of that. Their imagination is worth it’s weight in gold. Hi Becca, a gorgeous card so glad you and your mum are having a peaceful time reflecting on all your memories. I love the colors changing on the trees, but alas i am not at all keen on the Dark nights and Mornings . You card is beautiful & I love that sentiment. I have used it a few times myself. I am so sorry about your loss & pray that God will comfort you. Enjoy your Mom’s visit. I wish I could sit & enjoy a cup of coffee with mine again. I enjoy the smells of fall. I live on a farm in NE Iowa & there is always something interesting (& sometimes not so nice) to smell. My favorite is the fragrance of the evergreen trees as I walk to the mailbox. Hi Becca, This card is absolutely stunning !! I love the G45 image, I love all the die-cuts and the inking, and I adore the TH sentiment. You always create beautiful cards, and this one is absolutely stunning !! I have just finished doing my front garden, think it will be the last time this year, it is very cold here today our forecast was for an Arctic blast and they were definitely right, although next week it should turn warmer again. I’m not good with this time of year when we have a lot of darkness, I am a definite summer person, so I am counting the days until we have spring again haha. I keep telling my hubby I should spend half of the year in our country (UK) and half the year in Australia, and have the summer twice hahaha. Such an elegant and romantic card, Becca, and a wonderful sentiment! and drove by car from the West to the East coast. A fantastic journey; all the wonderful people we met, the beautiful landscape and the colors of the trees and landscape – becoming more and more brilliant the further east we went! I have never seen colors like that. Another beautiful card from you. My favourite autumn memory is, as a child walking through the fallen leaves in the orchard and kicking them up into the air. Yay for your mom being there with you!! I’m sure you will treasure this time with her! Fall always brings back cherished memories of my mom, in heaven now for 3 years-3 months now. The Monarch butterflies migrate though our part of Texas every year in October around the time of her birthday. We would always call each other when we first saw one, and now that she’s been gone, I always think of them as butterflies from heaven. This October I saw the first one on the afternoon of the day before what would’ve been her 81st birthday! God bless you for your grace and your stand in Him through the fire. You are such a wonderful inspiration and example to us all. I pray for you and your family. Thank you for the opportunity to have a chance at this lovely card. 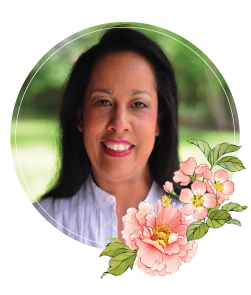 It would be such an honor to have one of your cards to encourage and inspire me. I look forward to all of your posts and welcome your new creations. I am happy to see your new videos once in a while again too. I missed your lovely (annointed) voice and excellent teaching skills! I am currently overseas and unable to view them, but once back in the States I will catch up once again. Firstly, please accept condolences for the passing of your brother. I am so happy that your mum is with you. You need each other at this time. I am a new blogger on your site. I absolutely adore your cards. They have so much depth and substance. Of course they all are so special. You are truly an artist.